Chipotle sees strong demand from burrito fans. The burrito business is booming, but rising commodities prices are taking a bigger bite. Chipotle Mexican Grill (CMG) is proving to be one of the best at bringing Tex-Mex to the masses. The fast food restaurant chain earned $83.1 million, or $2.64 per share, in the first quarter. That fell short of analysts' expectations, but the restaurant touted its strong sales. Even the winter weather didn't hurt demand for burritos and tacos. Chipotle shares rose in early trading, but the stock came under pressure in the afternoon and ended the day down nearly 6%. Revenue increased nearly 25% to $904 million in the quarter. And same-store sales, a key measure of growth, increased more than 13%. Chipotle has been on an big expansion push, opening new locations around the country with people often lining up for the restaurant's debut in their towns. And it has no plans to slow its roll. The company expects to open up to 195 new stores in 2014. 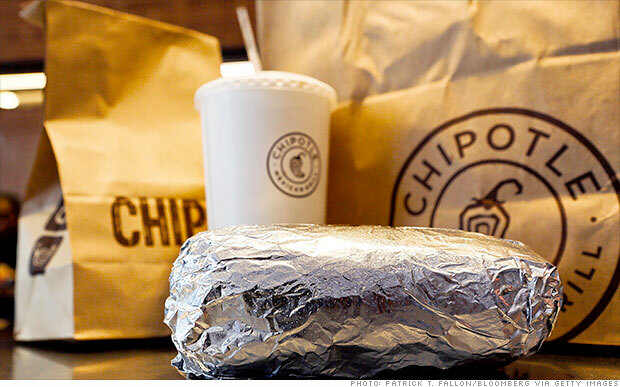 But rising prices for staple ingredients have been giving Chipotle some indigestion. Food costs ate up nearly 35% of its revenue in the quarter. Beef prices have risen to all-time highs as cattle farmers recover from two years of drought. Chipotle said its paying 25% more for steak. It expects cheese prices to increase 10% and the supply of avocados is down due to dry weather in California. With all the food price inflation, Chipotle plans to increase menu prices for the first time in three years, said chief financial officer Jack Hartung. "We're at a point where we need to pass along these rapidly rising food prices," Hartung said in a conference call with analysts. Menu prices will go up "somewhere in the mid- single digits" on a percentage basis, beginning this quarter, he said. Still, he said the company has built up a fair amount of pricing power. After three years, Chipotle feels it has "permission" to raise prices and may consider additional hikes next year. Market needs a correction. But this isn't 1929! The stock market is probably due for another pullback. But not a huge Great Depression-era styled crash. Is the stock market "correction" over before it even began? Worries about a possible U.S. missile strike against Syria are the latest catalyst helping to lift gold prices. Gold prices surged more than 3% Monday, topping $1,300 an ounce for the first time in a month. Prices of the precious metal were boosted by a weaker U.S. dollar, which declined against most global currencies, including the euro, the pound and the Japanese yen. Commodities such as gold are priced in the dollar and gain ground when the U.S. currency declines. The recent ups and downs in the stock market may be frustrating, but one strategist said the break in the rally is also creating an attractive entry point for investors who remained on the sidelines during the first few months of the year. Gold prices have dropped more than 10% during the last six months, and Wall Street analysts don't think a rebound is in the cards. Wall Street is turning its back on gold. Both Goldman Sachs and Deutsche Bank lowered their year-end forecast for the precious metal this week, citing an improving U.S. economy. Long-term Treasury yields are back above 2% -- and this may be just the beginning of a steady grind higher. The Dow Jones industrial average rose to a new all-time high Tuesday ... sort of. The record that everyone is talking about is in nominal terms and doesn't take into account the impact of inflation, which has increased more than 10% during the past five years, according to the government's Consumer Price Index (CPI).